When Summer officially comes to a close and Fall makes its entrance, many think of this time as a transitional period from scheduled vacations and long weekends to getting “back on the treadmill.” However, with the holiday season quickly approaching, it can also be a time for increased distractions, decreased levels of motivation and shifted focus. How does one maintain the same level of productivity in the workplace at times when it can feel so tempting to give in to the temptations of procrastination? When was the last time you walked out of your office at the end of a work day feeling a sense of overwhelming accomplishment? How frequently have you felt as if you didn’t check one thing off that long list of to-do’s? What was it that you did that led you to either that sense of accomplishment or feeling of defeat? 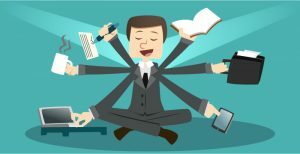 This Forbes article highlights five ways that you can increase productivity at work and best manage the 24 hours of each day you are given. It’s no secret that a good night’s sleep can be the difference between feeling rejuvenated, ready to take on the day ahead, or just the opposite: groggy and sluggish. Some days can be a “one cup of coffee” day, and other days, you can’t drink enough caffeine to keep the momentum going. The meaning of a good night’s sleep varies for each person, but for those mornings when you wake up feeling a little less rested than you should, a midday power nap can make a world of difference in your productivity. Try reading “Want to Improve Your Company’s Productivity? Try Power Napping” to learn more about the impact that your sleeping habits can have on your motivation to get work done.